GreehouseTruth Blog :: Unforeseen End to Global Warming? Scientists know of two core causes to climate change: a natural element (which I recently touched on here and here, as well as in chapter 4 of Is it Hot in Here), and the well-known human-induced greenhouse predicament often referred to as anthropogenic warming. No single issue can take the brunt of the blame for climate change, and there's little we can do about the former of the two. The latter though, being something we can take action on, has been heavily promoted as the devil within the details to dubiously take center stage as the poster-child for contemporary environmentalism. But a paradox exists within the view of human-induced global warming, punctuated by recent reports in the journal Science and from the federally charted National Petroleum Council this past month. In the July 27, 2007 issue of the journal Science, journalist Richard Kerr, who's reported on peak oil demands over the years, discussed a new report by the National Petroleum Council (NPC) that sheds a dim light on the near-future of energy, while unknowingly throwing a monkey-wrench into global warming forecasts (Kerr's article can be found here). The report from the NPC (here) that Kerr's article discusses, points out that oil supplies are dwindling, and fast. 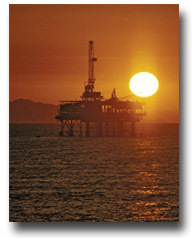 Currently, there are only about 2 or 3 trillion barrels of oil left in the ground to supply the world with fuel. That may sound reasonably bountiful, but it's not. We know there is a finite supply of this commonly used fossil fuel, and that at some point we'll just simply run out. That time is likely sooner than we think, and when—not if—it happens, our world will change in many ways, including effects to our climate. The natural petroleum we so often take for granted takes millions of years to form. We can deplete an oil reserve though in decades. In fact, this is the crux of the human-induced climate change conundrum: we are taking copious quantities of carbon-based fuel from the ground and dispersing its carbon byproduct (CO2) into the atmosphere at unprecedented and unnatural rates. It's almost like sucking out the helium from a party balloon; if you let out too much gas from the balloon, then your voice goes all whacky. If though the stored resource were let out slowly, then the change would not be so drastic, or as severe. On that same vein, if the resource is depleted too quickly, then none is left for later. Unfortunately, that's what's happening to our petroleum supplies as we speak. The U.S. consumption of oil is clocked at about 21 million barrels per day—or roughly 865,000,000 gallons of oil per day, of which, 409,500,000 gallons goes toward gasoline to fuel automobiles...every single day in the U.S. alone. Our rate of oil consumption worldwide continues to climb. At this point, we've already extracted all of the easy-to-get-to oil from wells around the globe. The rest—for what is left—will continue to become increasingly difficult to access. Couple this with an ever-increasing demand for oil, and it's easy to see that soon, enemy number one on the global warming front will soon just simply disappear. Although estimates point to enough affordable oil for another couple decades or so, global warming forecasts, like those worse-case scenarios touted in Al Gore's Inconvenient Truth, are premised on much longer timescales. Herein lies the contradiction to our climate that is so often overlooked, but rather obvious once taking into account the warnings from the recent NPC report. This ironic discord could be coined "The Petroleum Paradox," and is simply a matter of comparing the lifespan of affordable, easily obtainable oil and the timeline for the global warming catastrophes it's expected to produce. Climate change forecasts primarily use a single epoch as their point of reference: the year 2100. Gore's Inconvenient Truth, which is in large part a cherry-picking of tidbits from the IPCC's Third Assessment Report (TAR), relies on this crucial date, assuming that we'll be burning fossil fuels all willy-nilly throughout this century. But if oil supplies become extremely scarce by 2030 (which is well aligned with the NPC report), and completely dry up by mid-century, then we'll greatly reduce the amount of greenhouse gases pumped into the atmosphere well before the apocalyptically perceived year 2100 rolls around, simply because we just won't have the oil to burn. Oil won't just simply one day run out as though we flipped a switch and all the lights went dark. It will be a dawdling demise over the next couple of decades. Price for gas will continue to climb as supplies decrease and demands escalate. This in itself could slow consumption, but it wouldn't be enough to stem the tide. In fact, Dubai, with a 6% of its GDP coming from oil, has started to invest heavily into other projects so that in later years it can rely more on tourism dollars for revenue instead of oil. Kuwait too is feeling the pinch with its largest oil field, Burgan, beginning to bottom out. Still, oil supplies will merely slowly dwindle over the next couple of decades. As they do, alternative fuels could come on to the scene. These alternative energy sources, many of which I discuss in chapter 8 of Is it Hot in Here, would be lighter on the environment, although we could still take a serious punch to the pocketbook—if we can even get these alternative fuels online in time before oil wells run dry. If the world has to pay more for fuel, then worldwide economies will feel the heat—this time though it won't be melting the land of the polar bear. Instead, we'll end up paying more for not just transportation, but also on the products and conveniences available to us today because of the now (relatively) cheap price for fuel. As gas prices rise, so will the cost of food, clothing, and other goods that rely on fossil fuels to get to a store near you. And lest we forget, we do need to fuel our fighter aircraft, tanks, and troop trucks to power our military. I don't think anyone wants to imagine the ramifications from a reduction in our defense as tensions, in what could become a poorer Middle East, rise—heck, they hate us enough as it is; wait until their boom-days run out. In the meantime, the "sky is falling camp" underscores global warming as the greatest crisis facing our world today. In reality though, their major malefactor (fossil fuels) won't even be around to see the supposed apocalypse this culprit is supposed to create. While our world will no doubt be affected by human-induced greenhouse gas emissions, the human race and the societies and lifestyles we've become accustomed to will change, and it may not be pretty. Oil supplies won't be here for long, and finding ways to ensure a survivable future without them is paramount. The irony is so sad it's almost humorous: emphasis is directed toward issues 100 years from now, blamed on a source that will disappear in only half that time. Yes, it's paradoxical to say the least. But hey, it makes for great political fodder for the stump-thumping forerunners of 2008...doesn't it? To stay abreast on similar articles like this, you can signup for the free GreenhouseTruth newsletter. Additional information on climate events, the IPCC reports, global temperatures, alternative fules, and other topics discussed in this blog can be found in Nathan Cool's new book, Is it Hot in Here?--The simple truth about global warming. Click here to get your copy.